The original <menu> component offers a simple HTML label in a box with all of its (limited) rendering done at the server with a little help from CSS preferences. It is perfectly serviceable as a menu, but its appearance has very little flexibility. In general, the cs prefixed widgets such as <csMenuBar> form one set of tools, while the traditional menu widgets described in the Navigation Components chapter of Using Zen Components form another. These sets are not interchangeable. For example, a <csMenuBar> consists of <csMenuBarItem>, <contextMenu>, <csMenuItem>, and <csMenuSeparator> elements. A mixed specification in which <csMenuItem> elements are separated by <menuSeparator> elements causes the menu subsystem to break. It is important to note that there is inconsistency in the naming conventions. Not all of the client side widget names start with cs. The cs prefix is used only when the newer, client side widget name conflicts with the older, original widget names. Unfortunately this means that <contextMenu>, the widget at the heart of the client side menu subsystem, does not use the cs prefix, but every element around it does. The following sample <csMenuBar> element defines a horizontal menu bar with two picks: File and Edit. 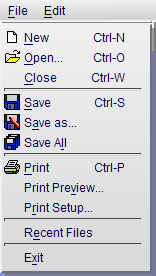 Each of these picks displays a different <contextMenu>. The <csMenuItem> components in this example illustrate a variety of options for setting associated icons, alternate captions, keyboard shortcuts, and so on. 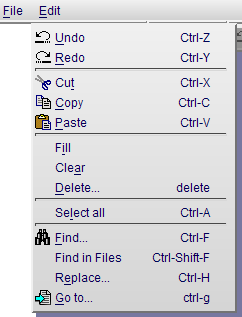 The following figure illustrates the File pick from this menu. The following figure illustrates the Edit pick from this menu. Zen invokes the callback specified by the onclick attribute. Optionally, you can also specify an icon and altIcon so that the icon can be toggled along with the caption. A toggleState of 0 displays the caption and icon; 1 displays the altCaption and altIcon. The toggleState changes only in response to user actions. You can use client-side menu components to define a popup or context menu for a region. To accomplish this, wrap a <contextMenu> definition inside a group of some kind. The wrapper component can be nearly anything, but is most often a reasonably significant portion of the page: a <vgroup>, <hgroup>, <form>, etc. Define the <contextMenu> as a child of the wrapper component, and a sibling of other elements within the wrapper. You can optionally specify exact bounds, as for the <group> shown in the next example, but this is not required. Subsequently, when the user right-clicks the mouse anywhere within the wrapper component, Zen displays and activates the <contextMenu> child component, rather than the browser’s default right-click menu. The following figure displays the popup menu that the previous example defines. The <buttonBar> component is closely related to the client side menu components. A <buttonBar> may appear inside any sort of group container, and may contain one or more <buttonBarItem> components. The following <hgroup> element defines a button bar with three buttons, rollover tool tips, and selection actions (the alert code). The following figure displays the button bar that this example defines. The following table lists the icons that are available in the csp/broker/images directory, which is a subdirectory of the Caché installation directory. The gray background color shown for icons in the table is just an example; the icons display over whatever background color the designer chooses for the containing component. The switch to using light or dark icons happens automatically, as long as you define the foreground and background colors of both <csMenuItem> and <csActiveMenuItem> using CSS. This allows Zen to calculate which icon yields optimum contrast with the current color. This is important even if the foreground or background color is being created using an image to create a gradient effect, as seen in the dark blue selected items in the previous examples. <csMenuBar> has the following attributes. Zen group attributes <csMenuBar> has the same style and layout attributes as other Zen groups. For descriptions, see Group Layout and Style Attributes in the Zen Layout chapter of Using Zen. <csMenuBarItem> has the following attributes. Zen group attributes <csMenuBarItem> has the same style and layout attributes as other Zen groups. For descriptions, see Group Layout and Style Attributes in the Zen Layout chapter of Using Zen. Text label to associate with this menu pick. Although you can enter ordinary text for this attribute, it has the underlying data type %ZEN.Datatype.caption. This makes it easy to localize its text into other languages, as long as a language DOMAIN parameter is defined in the Zen page class. The %ZEN.Datatype.caption data type also enables you to use $$$Text macros when you assign values to the invalidMessage property from client-side or server-side code. contextKey If defined, the contextKey is a single character that identifies which letter in the caption text can be pressed to invoke the functionality of the menu pick. contextKey is not case-sensitive. The contextKey character is underlined when the caption text is displayed. The <contextMenu> component may appear inside any type of group container, including <csMenuItem>, <vgroup>, <hgroup>, <form>, etc. A <contextMenu> component may contain as many sibling <csMenuItem> and <csMenuSeparator> components as are required to define and organize the individual choices on the menu. <contextMenu> has the following attributes. Zen group attributes <contextMenu> has the same style and layout attributes as other Zen groups. For descriptions, see Group Layout and Style Attributes in the Zen Layout chapter of Using Zen. The <csMenuItem> component may appear only within a <contextMenu> container. <contextMenu> may contain as many sibling <csMenuItem> and <csMenuSeparator> components as are required to define and organize the choices on the menu. <csMenuItem> has the following attributes. Zen group attributes In addition to its capabilities as a menu item, <csMenuItem> has the same style and layout attributes as other Zen groups. For descriptions, see Group Layout and Style Attributes in the Zen Layout chapter of Using Zen. altCaption Text to display for the menu item under alternate conditions, such as when the user toggles the menu item. The normal alternate to altCaption is caption. altKey If defined, the altKey is a keyboard shortcut that can invoke the functionality of the menu item under alternate conditions, such as when the user toggles the menu item. The normal alternate to altKey is key. Text to display for the menu item under normal conditions. If defined, and true, a checkmark indicates the toggled state of the menu pick. The checkmark displays when toggleMode is true. The default for toggleMode is false. toggleMode has the underlying data type %ZEN.Datatype.boolean. It has the value "true" or "false" in XData Contents, 1 or 0 in server-side code, true or false in client-side code. The <csMenuSeparator> component may appear only within a <contextMenu> container. <contextMenu> may contain as many sibling <csMenuItem> and <csMenuSeparator> components as are required to define and organize the choices on the menu. <csMenuSeparator> simply provides a horizontal line to separate sections of menu choices. <buttonBar> has the following attributes. Zen group attributes <buttonBar> has the same style and layout attributes as other Zen groups. For descriptions, see Group Layout and Style Attributes in the Zen Layout chapter of Using Zen. <buttonBarItem> has the following attributes.